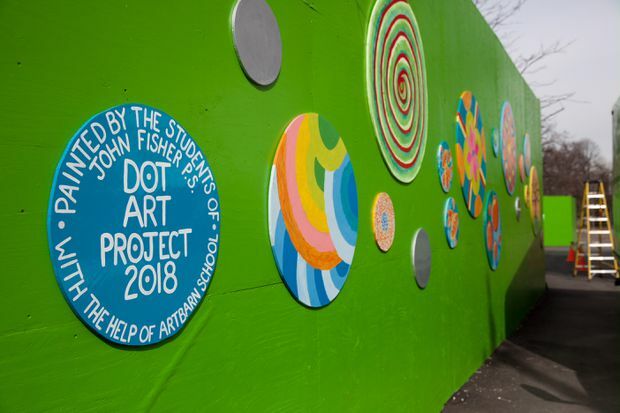 Artbarn co-ordinated groups of 10 to 15 students at John Fisher Junior Public School to each design and paint one of 69 plywood medallions, now fixed to a grass-green wall separating the apartment building’s construction site from the schoolyard. Right now and for at least the next several years, Toronto’s Eglinton Avenue will be enshrouded by monotonous kilometres of construction fencing, choking out the sidewalks and obscuring local businesses to passersby. Near Avenue Road, however, there is a colourful moment of reprieve. Instead of ads announcing new condo towers or the Crosstown LRT (the causes of the building boom), the words Make Art TO are woven through the chain-link in brightly hued yarn. The sign sits outside of Artbarn, a not-for-profit art school with a history of community collaboration and engagement. Although it looks like a renegade act of art bombing, it was installed in co-ordination with the Crosstown construction team by Artbarn’s crew of artist-teachers. Aside from being clever marketing, there’s also a strong message. Our city is in flux, growing at a dizzying pace and changing daily. We can either be furious, move away or maybe, just maybe, the best way forward is to look for creative, artistic solutions. “It was a fun project,” says Linda McMaster, Artbarn’s executive director, who appreciates how the sign creates a strong street presence for the school at a time when the street is eaten up by hoarding. Artbarn installed the Make Art TO sign last fall, but has also just helped complete another art-as-remedy project around the corner, at an even more fraught site. Last year, John Fisher Junior Public School, at Yonge Street and Erskine Avenue, was a contentious place. On a regular basis, parents and students stood outside protesting a 35-storey apartment slated to go up next door. Among the concerns were having 430 kids from senior kindergarten to Grade 6 attend class amidst construction debris, dust and disruptive noise. When the building became an inevitability (the City of Toronto and Mayor John Tory were against the project, but were overruled by the Ontario Municipal Board, which pushed it ahead), the developers, KG Group, provided a $10,000 budget for the school to turn the otherwise uninspiring construction hoarding into something artistic for the kids to look at. Instead of hiring a painter to cover the construction wall beside John Fisher Junior Public School, “we wanted each of our 430 students to be physically involved in creating the project,” says principal Marlene Harroun. Instead of simply hiring an outside painter to do the surface, “we wanted each of our 430 students to be physically involved in creating the project,” says John Fisher’s principal, Marlene Harroun. Artbarn co-ordinated groups of 10 to 15 students to each design and paint one of 69 plywood medallions, now fixed to a grass-green wall separating the apartment building’s construction site from the schoolyard. The weather-proofed, plywood circles range from one to four-feet wide, with the younger kids tending to paint the smaller discs. Although the medallions came out of a stressful period for the school, it didn’t serve as an opportunity to keep griping. “The only questions we heard were about what will happen to the dots after the construction is over,” says Ms. Harroun. But long after the apartment building is up, and the controversy surrounding it is forgotten, the dots will live on. 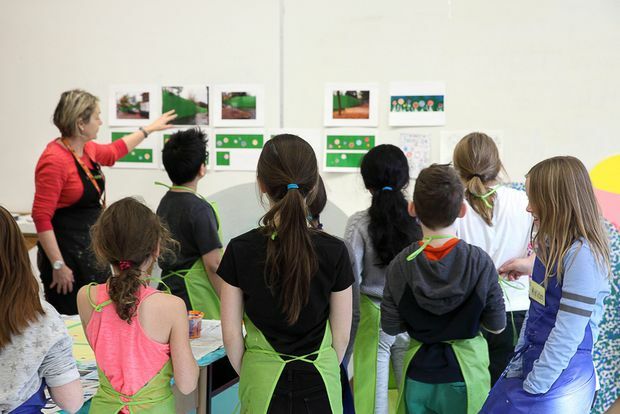 “We wanted the project to be something that shows the students that art isn’t just static, it can grow and live and breathe.” says vice-principal Lee-Anne Maier. As such, when the hoarding comes down, in approximately three years, the medallions can be removed and reinstalled in the playground.